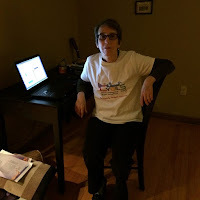 Saturday night I got all dressed up in my Cybils shirt to meet with my judging colleagues in a Googles Hangout to discuss the middle grade fiction section of the Cybils Awards. "Typing" with blogging buddy Alex from The Children's War was almost like meeting her. Except for the part about not being in the same room. Or town. Or state. After we finished the job we were there for, we chatted about other awards people had been involved with and whether or not we'd worked with the Cybils before. I was a first-round judge ten years ago, during the Cybils' first year. That first year, judges received masses of nominated books from publishers. The people I was communicating with loved hearing that I received bags of books to my door. I kept both UPS and FedEx busy. It was a great time. And, of course, I documented it. 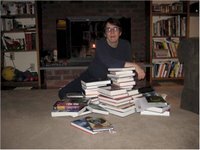 Here I am ten years ago with my Cybils books. I took the month of December off that year to read and blog. You'll be hearing about all the Cybils winners next week. What a fun idea! I rarely take pictures of anything, so I'm jealous. There were some books from my stint this year in YANF, but many went on to the high school. Glad you enjoyed yourself! It was great fun to finally meet you, too, Gail. We had a really nice group. I love the t-shirt and think I might just get one myself. Like Ms. Yingling, I almost never document things with photos either, but may reconsider that. Those are a lot of first round books in that 2006 photo, but maybe I'll see you back at Cybils next year for some more second round judging.